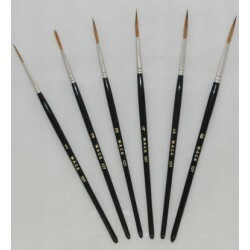 Buy Mack Brush Series 127 Script Brushes here, Available in sizes 1, 2, 3, 4, 5, and 6. Hair Lengths vary from 11/16" to 1", Excellent for Fine Line, Scroll Work, Signwriting, China and Ceramics painting. Made from Pure Kolinsky Sable which are extra fine. Individual Brushes LISTED BELOW!